The London to Cape Town World Cup Rally endeavours to capture the spirit of the long distance World Cup Rallies of the 1970s. The event is not designed as a tour but as a “press on” driver’s challenge with Time Trials and a time-schedule to be maintained every day. The ambition is to revive the kind of rallying last seen on the 1977 London to Sydney marathon. 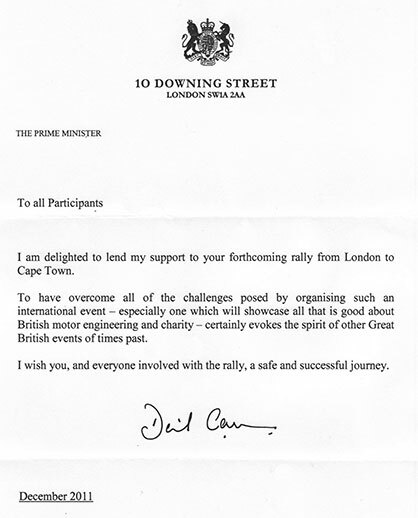 As the January 1st start date approached and several years of planning came to an end the Prime Minister found time to send a letter with his best wishes to the crews and all involved with the London to Cape Town World Cup Rally. Philip Young is the driving force behind the Endurance Rally Association. Since their first major international event, The 1988 Pirelli Classic Marathon, the E.R.A. has promoted and organised more than 60 international rallies through more than 50 countries throughout the world. A call or email to the Rally Office will put you in touch with the most experienced organising team in the business. If you have never taken part in such an adventure and don't have a suitable car, or if you are a highly experienced competitor looking for your next challenge, the team at the Endurance Rally Association office in Didcot will guide you each step towards the start line.